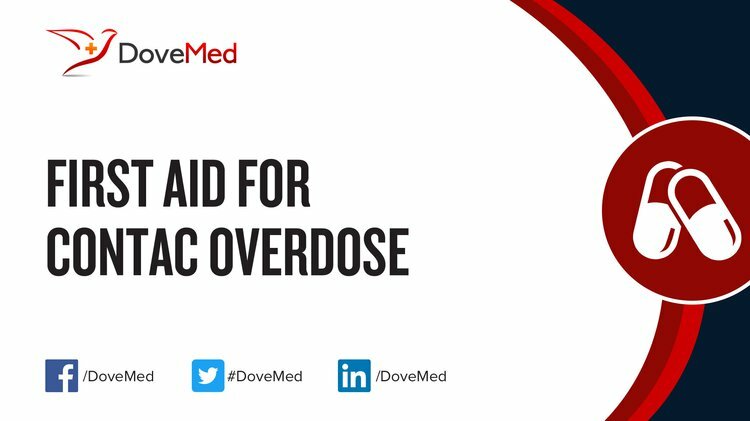 Contac Overdose is the accidental or intentional intake of the drug in dosage higher than prescribed values. What are the Causes of Contac Overdose? What are the Signs and Symptoms of Contac Overdose? The signs and symptoms of Contac Overdose can vary from one individual to another. It may be mild in some and severe in others. Several systems of the body may be affected. How is First Aid administered for Contac Overdose? Who should administer First Aid for Contac Overdose? First aid for Contac Overdose is administered by healthcare professionals. What is the Prognosis of Contac Overdose? How can Contac Overdose be Prevented? Johnson, E. M., Lanier, W. A., Merrill, R. M., Crook, J., Porucznik, C. A., Rolfs, R. T., & Sauer, B. (2013). Unintentional prescription opioid-related overdose deaths: description of decedents by next of kin or best contact, Utah, 2008–2009. Journal of general internal medicine, 28(4), 522-529. Mercado-Crespo, M. C., Sumner, S. A., Spelke, M. B., Sugerman, D. E., & Stanley, C. (2014). Notes from the field: increase in fentanyl-related overdose deaths–Rhode Island, November 2013-March 2014. MMWR, 63(24), 531. Watve, S. V., Sivan, M., Raza, W. A., & Jamil, F. F. (2012). Management of acute overdose or withdrawal state in intrathecal baclofen therapy. Spinal Cord, 50(2), 107-111. Wheeler, E., Jones, T. S., Gilbert, M. K., & Davidson, P. J. (2015). Opioid overdose prevention programs providing naloxone to laypersons—United States, 2014. MMWR Morb Mortal Wkly Rep, 64(23), 631-635. Bohnert, A. S., Roeder, K., & Ilgen, M. A. (2010). Unintentional overdose and suicide among substance users: a review of overlap and risk factors. Drug and alcohol dependence, 110(3), 183-192. Banta-Green, C. J., Beletsky, L., Schoeppe, J. A., Coffin, P. O., & Kuszler, P. C. (2013). Police officers’ and paramedics’ experiences with overdose and their knowledge and opinions of Washington State’s drug overdose–naloxone–Good Samaritan law. Journal of Urban Health, 90(6), 1102-1111. Anderson, D. D., Van Hofwegen, C., Marsh, J. L., & Brown, T. D. (2011). Is elevated contact stress predictive of post‐traumatic osteoarthritis for imprecisely reduced tibial plafond fractures?. Journal of Orthopaedic Research, 29(1), 33-39.